Based on proposal instructions, you will receive separate outlines for each volume. The document will have a pre-established MS Word style guide compliant with proposal instructions. All documents are fully editable. Based on the RFP release date and proposal due date, we recommend a proposal schedule with specific milestones to keep your team on track and produce a good quality proposal. This day-to-day schedule identifies key actions to guide your team through completion. Fully editable, change the schedule based on your resource availability. Do you have a concept or idea that can be turned into a graphic but don’t have time or capability to create attractive proposal graphics. Send us your hand-drawn stick figures, we will return absolutely professional graphics that project a professional company image. We apply creative talent but keep compliance in mind – before creating graphics, we review RFP font size, file size, and other limitations. Subjective non-compliances that need your decision are listed in a non-compliant items matrix for you to resolve prior to submission. Includes a set of PowerPoint slides to develop a proposal kickoff package. All slides discussing proposal instructions, evaluation criteria, and statement of work are already filled in. The suggested proposal schedule is included and can be changed to suite your organizations resource availability. The package also includes suggested slides for you to complete such as bid strategy, key personnel, etc. based on the requirements of the RFP. 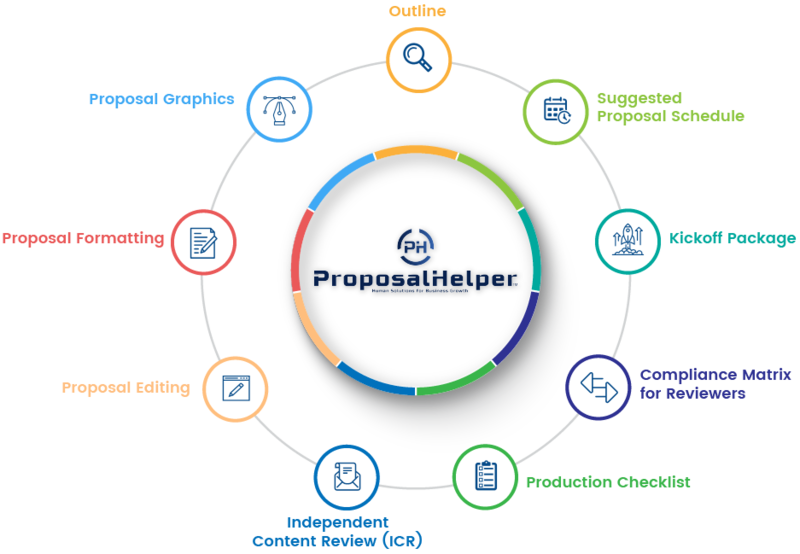 With our proposal kickoff package, you will communicate a strong foundation for a winning proposal. The overall objective is to develop a smooth flow without losing substance. Editorial changes are tracked and only incorporated with writers’ permission. No risk of changing the meaning of a sentence. You decide which changes you want to keep and which ones you want to ignore. use our experienced evaluators to review your proposal for relevance and compliance. Get an independent assessment and detailed evaluation report from our reviewers grading the proposal content. Reviewers are proficient in Government contracting and proposal evaluations. Reviewers are also technically proficient in the scope of work being reviewed. Reviewers do not just find gaps but also provide recommendations to fix the gaps. Contains a detailed cross mapping of Proposal Instructions (typically Section L), Evaluation Criteria (typically Section M), and Statement of Work (typically Section C). Depending on the RFP, we may cross-reference other solicitation sections also. Includes a row-by-row evaluation field for reviewers to provide consistent feedback. Last minute stress typically results in missed production details. Use our tailored production checklist specifically based on RFP instructions. Check off each item to ensure a compliant proposal. Includes a fully editable document to include your own quality check items. our experienced BidHub RESEARCH team. Avoid blending in with the competition-Be concise, be compliant!